"The more you read, The more you know. When speaking your mind or making your choice." Use the toolbar below to search our Destiny Catalog. Thank You for Clipping Box Tops! The Moses Y. Beach library media center is open for student borrowing when students visit with their classes or by special arrangement. Students in pre-kindergarten through second grade visit the library once each 6-day rotation for a library lesson. 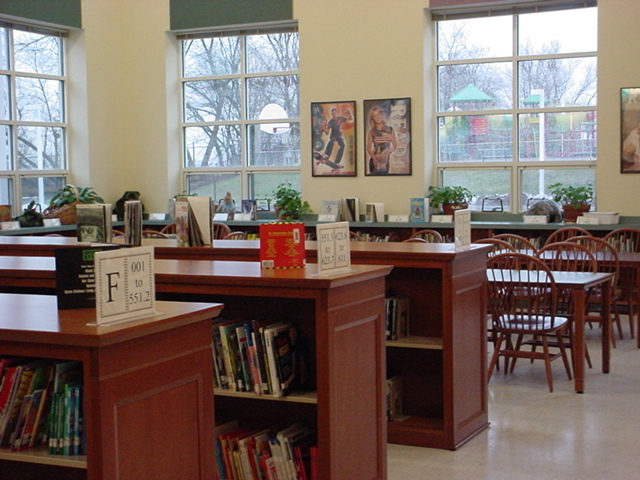 Students in grades K through two also use the library throughout the school year for enrichment activities and research based learning through collaborative projects with their classroom teacher and the library media specialist. PreK students have time to explore books each time they visit the library. We no longer stamp due dates in our library books. Students should plan on returning their library books at their next class. If they have not finished reading a book they may keep it for an additional week. After that, students should bring the book back to school to return or renew if necessary. Students must return overdue library books in order to continue borrowing. There are no fines for overdue books. Any lost or damaged books must be paid for according to Board of Education policy. Thank you for helping your child be an enthusiastic and responsible user of the MYB Library! Thank you for clipping Box Tops for our school! Please continue to save and clip Box Tops. You may send them in at any time in a baggie or envelope labeled with your child's name. The classroom with the most Box Tops collected wins a bookmark for each student and a new book for the MYB Library which is dedicated to the class. Box Tops may be sent into school at any time. Submissions are made three times per year: October, February and June. The money we raise with Box Tops allows us to purchase great new books for our library throughout the school year! Each year the Moses Y. Beach Library sponsors a used book event to coincide with Read Across America Day in March. It has been a great way to get gently used books in the hands of children. We will have a school-wide used book swap with a spirit day fundraiser. We have used this day to give back to worthy causes in our community. In the past, we have made substantial donations to the national charity First Book, the local charity Read to Grow, as well as being a part of a $4,000.00 community fundraising drive for the Wallingford Public Library after a flooding disaster. You are welcome to drop off your gently-used children's books (appropriate for grades PreK - 2) to the library or main office at any time. MYB is also home to a Little Free Library! It is located in the front of the school by the main entrance. Your gently-used children's books will also be used to supply our Little Free Library with books throughout the year. Your child is also welcome to put their own books they have finished reading and would like to pass on into the Little Free Library themselves. We greatly appreciate your support of literacy and community fundraising! If you are reading this web page, you know how important it is to read regularly over the summer. Research has shown reading over the summer helps maintain and even improve reading skills. Students who do not read over the summer start the new school year at a disadvantage. Fortunately, it is easy to keep summer reading fun! Try to read about 20 minutes every day- set aside time to read regularly for the whole family. What Should We Read This Summer? Reading together with your child has many benefits, even after your child learns to read on their own. See the Wallingford librarians' suggested summer reading list for many great titles that the whole family can enjoy! These are on display in the Children's Room at the WPL as well. All Wallingford students have been asked to set a reading goal for themselves this summer. Goals can range from making time to read every day, reading a certain number of books or minutes, or continuing work on a reading goal that had been a focus during the school year. Goal setting brochures can be found here in English and Spanish. The Wallingford Public Library offers a free, fun and exciting summer reading challenge for students. Click here to sign up for summer reading at the Wallingford Public Library. If your child is participating in the Wallingford Public Library's summer reading program, books are logged online. At the end of the program, the WPL will share lists of students who have participated and completed their reading challenge with each school's librarian. No need to send anything back to school! Or, use the Wallingford Public Schools Goal Setting Brochure. All materials distributed by the school system in June are available at the district Summer Learning Website. Or, write the titles on any piece of paper! Each student who has a record of reading this summer will be counted for our school in the statewide Governor's Reading Challenge, and be recognized at MYB in September. Please have your child return any record of summer reading to their classroom teacher at the start of the new school year, unless they have participated in the Wallingford Public Library's Summer Reading Challenge. Please email Mrs. Porier with any summer reading questions: aporier@wallingfordschools.org. PreK students see Mrs. Porier twice each week for library lessons. PreK lessons use a "push-in" model where we bring the library up to the classroom! This developmentally appropriate practice allows the PreK students to enjoy library lessons in the space that is best suited to their physical and emotional needs. PreK students learn about a range of PreK themes such as: colors and shapes, the alphabet, numbers, seasons, animals, and more! Students explore topics through stories, songs, movement, puppets, felt boards, and hands-on activities and crafts! Some of our favorite PreK stories are: Rosie Goes to Preschool; Knuffle Bunny; Bark, George! ; Chicka Chicka Boom Boom and many more! Kindergarten students visit the library each week for a library lesson. We read a wide range of fiction and nonfiction titles, and learn about the difference between these two types of books. When we read fiction we are thinking about imagination. When reading nonfiction, we are thinking about information. We are learning some sign language to help us remember these words as well. Kindergartners can expect to read, sing, act out stories and choose a book each time they visit the library. Kindergarten students also have collaborative lessons with Mrs. Porier and their classroom teacher in the library, their classroom, or outside! Many of our collaborative classes connect to the Kinderwoods program and integrate the new Next Generation Science Standards. Our collaborative classes take place about once each month. First graders are on their way to becoming more independent users of the library. They will learn more about how the library is organized and which types of books are found in which sections of the library. We will share stories from different areas of the library, tour these areas, and learn a song to help us remember where different types of books can be found. Students can make the best book choices for themselves when they are aware of how the library is organized. A reminder that student choice is the best motivator for developing a love of reading. Rereading old favorites is a great way to build fluency. If a book is too challenging for a child to read on their own, they may enjoy looking at the pictures or having it read to them. Even after children are reading on their own, keep reading to them. A great deal of learning takes place when a child is read to, not to mention the many benefits of spending that cozy time together! First grade students will also participate in collaborative lessons throughout the year taught by Mrs. Porier along with the classroom teacher. Students will explore families and traditions, hone their writing skills by adding their own words to wordless books, and engage in research as well. MYB Second graders are ready to take off as critical readers and researchers. They will explore award-winning literature by participating in a mock-Caldecott contest, and will also read and vote for their favorite Nutmeg nominee. The MYB library has a limited number of copies of each Nutmeg title. More can be found at the Wallingford Public Library. Students are encouraged to read (on their own or with a grown-up) as many of these titles they can before the April vote. Students in second grade will also become more proficient at locating books on the library shelves by learning about call numbers. These skills will help students as they begin their journey as lifelong library users. Second grade students also take part in collaborative lessons with Mrs. Porier and their classroom teachers. We engage in a study of trees to complement an organisms unit that is part of the science curriculum. We will use nonfiction books to learn about trees, as well as take several walks on our school grounds to identify and observe the trees around us. We will also explore poetry writing and its many forms. Students will read engaging poetry, as well as write and share their own poetry. Check out these great websites to help you and your child find books you will all enjoy. Check on titles, reserve books, look for links to great resources here. Access BookFlix with your library card to read and watch animated versions of hundreds of wonderful children’s books, and much, much more! Wallingford school and public librarians collaborate each year on a list of suggested titles for students in grades PreK - 5. These great titles are not just for summer reading! Enjoy them all year round! Author James Patterson has created this website, Read Kiddo Read!, to provide families with lists of outstanding books that kids will love. It is arranged by age and the choices are truly excellent. This website is part of a summer reading initiative of Reading Rockets, a wonderful parent literacy resource and partner of Reading is Fundamental, the oldest and largest children’s and family non-profit literacy organization. An extensive page of great book lists are compiled here, organized by read-alouds, age, theme, and even a book finding tool that allows you to customize a search based on your child's interests. The site also has great information for parents on encouraging literacy at home. Each year a large annotated list of the year’s best books are compiled. Please contact Mrs. Porier at any time for assistance with locating the best books for your child! The Moses Y. Beach PTO sponsors two fundraisers for the MYB Library Media Center. Participation in these programs is greatly appreciated. All funds raised go towards the purchase of materials for student use. Families are invited to purchase a book in honor of a special day in their Moses Y. Beach student's life, such as a birthday or the start of school. A book plate with the child's name and date of the special event is placed in the book. The child is the first to check out the book, which then becomes part of the MYB library collection. Celebration Book forms are sent home at the start of the school year, or you may print the form from this website. Students are invited to display a collection in one of our hallway showcases. Forms are sent home at the beginning of the year for students to sign up. If space is available, students may sign up later in the year as well. The form is available for download here. MYB students worked with Mrs. Cislo (IT Teacher) and Mrs. Porier (Library Media Specialist) to create a PSA introducing our new Buddy Bench. We wanted MYB students to know what the Buddy Bench is and how students can use it. Click here to view!